believing that they are found in luxurious items and a wealthy lifestyle. The protagonist of the story, Indika, is from the middle class. However she is not satisfied with what she possesses and dreams of a comfortable existence in the glitzy and glamourous world pampered and adored by everyone. She begins relationships with three boys, hoping to achieve worldly goods through their riches. However each time she meets a wealthier person she leaves the other without a backward glance. At one stage she even contemplates in entering the spotlight as an actress. Both Sumedha and Dayananda become victims of her plots but it is ultimately Wimal who teaches her a lesson, one she should have realized before playing with other's emotions. "The main character of the tale lives in one of the rows of houses in Maradana. I wrote the tale from what I observed in the society. Very few have written stories based on the middle class society. This also highlights a social issue which had been hidden within the folds of the society for centuries," Dr. Ranasinghe noted. 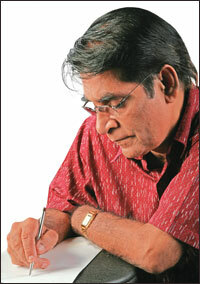 He had previously composed three novels: Landuni Mata Varam Natha (MY Dame, I Have No Opportunity) in 1975, Vinkal Bass (Bicycle Repairer) in 1978 and Kristhuni Karunakara Manawa (Oh Jesus, Have Mercy in 1995.